Plants of the Sparaxis genus are hardy bulbs that are usually grown as annuals by gardeners. Sparaxis range in height from 30 to 60 cm and naturally bloom from the middle to late spring (sowing late can result in summer blooms). They have lance shaped leaves and carry trumpet shaped flowers on spikes; the Sparaxis flowers may be of pink, purple, red, orange or white. Some common names for Sparaxis plants include Harlequin Flower and Wandflower. 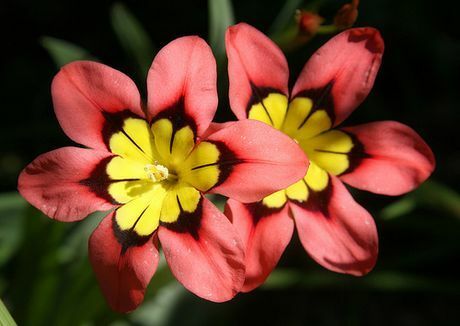 Sparaxis - Harlequin flower by Aussiegall; Creative Commons. Common Names: Harlequin Flower, Wandflower, Sparaxis. Life Cycle: Half hardy bulb commonly grown as a half hardy annual by gardeners. Growing Region: Zones 3 to 10. As a perennial in zones 8 to 10. Flower Details: Red, yellow, cream, purple, pink; often multicoloured. Bell-shaped. Sometimes fragrant. Sow Outside: Spacing 4 to 6 inches (10 to 15 cm). Seed: Cover seed. Start of spring or autumn. Bulb: 3 inches (75 mm). Bottom layer of sand. As an annual: plant in spring, will flower in summer. As a perennial in warm areas: plant in autumn, will flower in spring. Sow Inside: Germination time: one to three months. Temperature 50°F (10°C). Two months in advance. Transplant outdoors following the last frost in cool areas, or at the beginning of autumn in warm areas. Requirements: Full sunlight. Soil pH 7 to 8.5. Can survive in dry soils. Provide support as the stems are thin. In the spring supply a top dressing of cow manure. Regular feed. Regular watering. If growing as a perennial bring bulbs indoors in cool areas in the autumn. Propagate: use offsets. Harlequin Flowers and other Sparaxis plants can be grown from outdoors from bulbs or seeds. The Sparaxis bulbs should be planted with a little sand about 7 or 8 cm deep in the spring (summer blooms) or autumn (spring blooms); seeds should be sown in either early autumn or early spring and lightly covered once sown. Ideally Harlequin flowers and related species should be grown in a sunny part of the garden that has a neutral or alkaline dry soil. When starting off indoors sow Sparaxis seeds about 10 weeks in advance. They should take about one to three months to germinate at 10 to 12 degrees centigrade. Transplant the young Sparaxis seedlings outdoors following the last frost of spring with a spacing of about 10 cm. 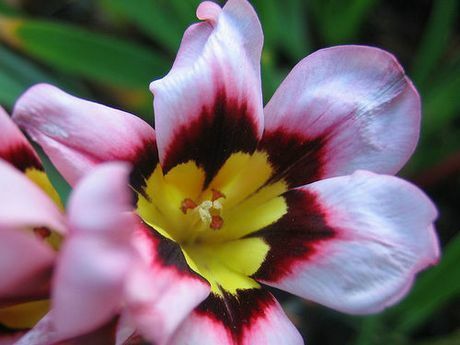 It is easy to care for Sparaxis plant species such as Harlequin flower and Wandflowers. In the spring tome they should be supplied with a top dressing of cow manure. When growing provide a regular watering and fertilizing. If grown in an exposed area it may be a good idea to supply a light stake for the Sparaxis plants. If you require more plants then Sparaxis can be propagated by planting the offsets.